I know someone who is very handy with old boxes and those sorts of things. He’d get “trash” and cut them up to make them useful – like a DIY iPad stand, for example. But, have you ever thought of making something useful out of those plastic pizza box supports that come with every pizza you order? If you’re anything like me, you’ll end up with so many of those things. Either that or you just throw them away every time. Here’s a cool idea from Serious Eats: recycled pizza box support as a mobile phone stand. It’s rather simple, actually. You just need to get that plastic thingamajig, and make sure you wash it thoroughly. I would think that dishwashing liquid can remove all that grease. (The last thing that you would want is grease to get all over your phone and probably ruin it.) Snip off the front leg and mount your mobile phone. I am not sure about the angle – you might have to do a little bit of cutting off here and there to get your desired angle, but you get the idea. I say it’s a cheap – not to mention semi-creative – alternative to mobile phone stands that you can buy today. 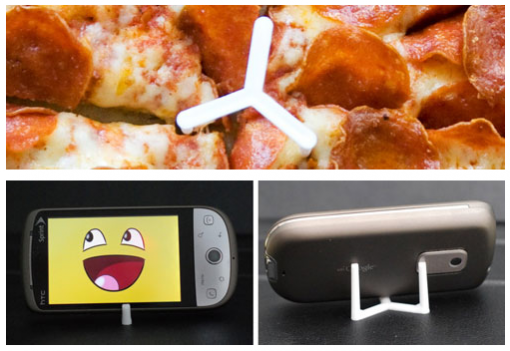 This got me thinking – what other “everyday things” can you turn into something useful like a mobile phone stand?